CONFUSION reigns over the issue of the Irish language being used as a second language in signage for the St Patrick’s Trail, a cross border project. After behind-the-doors discussions in Down District Council as to whether a barrister should be invited to explain the legal position surrounding a dispute with the Northern Ireland Tourist Board pursuing a single-language policy, concerns have been further raised. 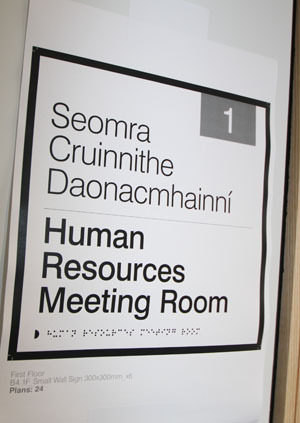 Discussion in Down District Council has been long drawn out and has been made more complicated following the NITB’s decision to pursue a single language policy, ignoring the use of Irish in its signage. This matter has caused a major problem in the development of signage for the St Patrick’s Trail project and Sinn Féin Down District Councillor Eamonn Mac Con Midhe has demanded that the Irish language be included in this signage. Councillor Eamonn Mac Con Midhe has defended the right to have the Irish language used in new signage for the St Patrick Trail. Councillor Mac Con Midhe said: “Sinn Féin Councillors have campaigned for the inclusion of the Irish language and basically we want to see the Good Friday and St Andrews’ Agreements in respect to the Irish language fully accepted. These are international agreements. Only recently did Down District Council accept an Irish language policy, and yet I am concerned that Council officials and members of other parties do not fully understand this legal obligation. “All we are asking is that Down District Council fulfils its obligation and plays its part in promoting the Irish language in the St Patrick’s Trail. We will be contacting Sinn Féin Councillors in the Newry and Mourne Council to ensure that they too support this as the trail also runs through their Council area. “When these signs for the St Patrick’s Trail are erected in other counties in the Republic of Ireland in Counties Louth and Monaghan, they will be in English and Irish, yet they will be only in Irish in the North. A sign in the new Downshire Civic Centre in English and Irish. A spokesperson for the NITB responded to the concerns on the exclusion of the Irish language in signs on the St Patrick’s Trail and said: ‘The St Patrick’s Trail is a key initiative within the St Patrick and Christian Heritage Signature Project. “The NITB continues to work with stakeholders to further develop and enhance the St Patrick’s Trail tourist driving route, which runs from Bangor to Armagh, through Downpatrick and Newry, and provides advice and support to key Patrician and other associated Christian Heritage sites along the Trail. These include physical infrastructure work around visitor access and improvements with bespoke interpretation, visitor orientation and signage. “The NITB works closely with local councils to contribute part funding to tourist signage. NITB is entirely focused on the experience of the visitor to Northern Ireland, and therefore keen to ensure that all tourist interpretation and signage is clear, does not confuse our visitors and assists them in understanding the importance of the destination. Newry and Mourne Councillor Michael Ruane also expressed his disapproval of the NITB position over the exclusion of the Irish language in signage in the St Patrick’s Trail. He said: “We have an Irish language policy in place in our Council. We were the first council in Ireland to employ a dedicated Irish language development officer. Our signs are mainly in Irish-English and we have had an Irish language committee for around 20 years. “The Newry area has the highest percentage of Irish speakers in the North. The Council has therefore pursued a bi-lingual policy for many years and it is an accepted part of the work of the Council. This work even covers the adoption of Irish street names. The Council audits the local residents to see if they are in favour of this and it then goes to Council for adoption.